I had to take care of some personal business the last couple of weeks. I’m back. Yesterday, we closed on the sale of my parents’ house of 40 years — my childhood home. We moved into Echo Valley when I was eight years old and I moved out the day of my wedding a little over twelve years later. We’d previously lived in a parsonage. That’s a house owned by a church to provide a residence for its pastor. About eight years into my Dad’s pastorate of Forest Highlands Baptist Church in Little Rock, my parents – with the help of a developer, a banker, a contractor, a decorator, an architect and a building supplier in our congregation – decided to build a house. It was a good decision. From the day we moved into the house on Echo Valley Drive in 1974 until the day my parents – both in failing health at the time – moved out in late 2013, it was filled with people making good memories. It’s where my three brothers and I, our wives and children and their children, gathered for birthdays, anniversaries and holidays. Extended family and friends near and far were always welcome. Mom is a great cook and both my parents have the gift of hospitality. It is no exaggeration to say that over the 39 years Johnny and Carlene Jackson lived there, guests numbering into the thousands from across the United States and all over the world ate at their table and slept in their guest rooms. Dad was more than just a fan of classic movies. He was a devotee and authority on them. He grew up going to the local movie houses in South Arkansas. Dad introduced me to Humphrey Bogart, John Wayne, Cary Grant, Jimmy Stewart and many more. He was the first person I ever heard make the case that 1939 was the greatest year in movie history. He didn’t claim it was an original position but he did adhere to it. He was eleven in ‘39 and a number of the movies released that year were still on his must-watch-whenever-they’re-on list. My Dad was a born entertainer. He grew up singing with his brothers — their mother at the piano. I learned the art of storytelling and the timing of a good joke from him. Growing up in the South, in a Baptist pastor’s home is a pretty good place to learn such things. Dad appreciated the inherent drama of a good story whether it came from the Bible, the newspaper, an article in Sports Illustrated, a classic novel or one of his favorite TV westerns or cop shows. He also knew how to share his own life experiences in a way that was engaging. Pay attention to structure, details and payoff – that’s how you tell a good story. Johnny Jackson Sr. died this past October. He had 85 good years and about three really bad months health-wise. It became clear that with Mom’s ongoing health challenges she was not going to move back into the house. So, through the fall, holidays and first of this year we’ve been going through their things as carefully and respectfully as possible and getting the house ready to sell. Dad was an inveterate list maker and record keeper. He kept incredibly detailed notes on his more than sixty years in the ministry. He kept notes and mementos of big and small moments in the lives of all his children, grandchildren and great grandchildren. He kept news clippings and his own hand written notes on the seasons of his teams: Arkansas Razorbacks, Dallas Cowboys and New York Yankees. So, I was delighted but not surprised to find a couple of movie lists in a file folder kept in the “nest” near his recliner. 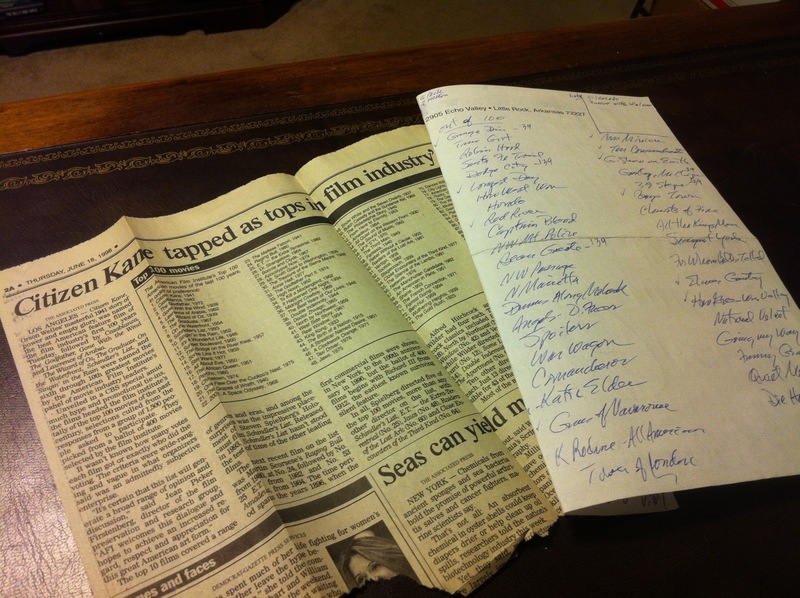 In the folder he kept AFI’s original list of Top 100 movies that he tore from the pages of the Arkansas Democrat Gazette. There was also a piece of stationary filled with his scrawl, front and back, listing several categories of movies he liked. They were cross-referenced with how many were on AFI’s list and how many of them were released in 1939. I studied his list with a smile on my face and tears in my eyes. This blog is a tributary that springs off the river of my Dad’s legacy. Talking about movies, making lists, offering help, passing along information, telling a good tale – it’s in my blood. Thanks for coming along and taking part. Tim, I never had the chance to meet your father. But you clearly come from good stock. Prayers continue for all of you. Thank you, Andie. You and yours have been very encouraging along this path. It’s the little quirky things we often remember with the most fondness, isn’t it? Thanks for letting us see a little more of how special your father is. Thanks so much, Kelly — and yes, it’s the eccentricities and habits that I miss and that make me smile. Just last night I was thinking that I wanted to know more about what lead to your great interest in movies and storytelling. Your journey, as it has unfolded on Facebook over the last few days, has been touching and compelling. Now I know the answer to the my question. You indeed share your father’s engaging storytelling ability. That’s very kind, Kime. Thanks so much.